Harvey Nichols opened the doors to their new 45,000 sq. foot store in 2015, following the redevelopment of the iconic Mailbox in Birmingham. 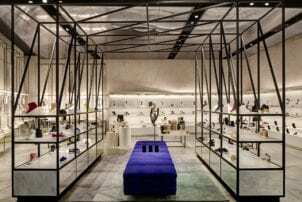 The store offers a new flagship design by Virgile and Partners, housing over 200 luxury fashion, beauty and food brands. The store offers a unique event space. The Brasserie seats up to 55 covers, with a Private Dining Room for up to 16 guests. Dinner can be enjoyed on the interactive Chef’s Table for up to 8, or a bespoke wine or spirit tasting can take place in the Wine Shop with the Wine Specialist. Known for their Wine Dinners, Harvey Nichols Head Chef and Wine Specialist can design a bespoke menu for your guests. Make your event memorable by adding the finishing touches, a food and wine hamper from the Foodmarket for your key guests, or goodybags for those in attendance, or treat your guests to beauty and skincare treatments in the Spa rooms. The Store can accommodate up to 500 guests for a number or events. Book this venue or let us help you find more perfect Venues in Birmingham for your event.